Today and on each of the next 100 days or so I'm going t.o try to honor these brave Cubans by sharing their names and little about their respective stories. Ever since I started this blog, I have felt it vital to remember their names, names the regime would rather have the world never know. That is the only way to fully grasp the injustices they are suffering. Today's prisoner is Eliseo Castillo Gonzalez. An activist with the Patriotic Union of Cuba, or UNPACU, Castillo has been imprisoned since Aug. 31, 2012, after he was convicted of supposed charges of "disrespect" and "attacking" and sentenced to 2 years in prison. His real crime, according to the human rights commission, was speaking out against the Castro regime. 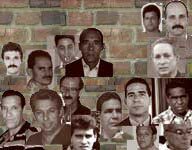 UNPACU is one of the most active opposition groups on the island, and several dozen of its activists are reportedly in Cuban jails.